← Mummy, Why Did You Take Cancer Treatment? Yesterday’s blog really inspired me to write today’s. And one of the hardest things to do as a woman undergoing Chemotherapy treatment is accepting the fact that your hair will fall out and then grow back in wacky ways. I know some patients use the Cold Cap, but I have heard more often than not, hair will still fall out and worse, in clumps away from where the cap didn’t cover. So a woman can end up with a funkier more undesirable effect than originally anticipated or described. We know hair is so much a part of who we are and when it’s gone it’s difficult to describe the insecurities and vulnerabilities it exposes. When my hair started to fall out from Chemotherapy, I had already done research on looks and designers, purchased coloured cotton beanies, scarves from top designers, Thrift shops and a few Trilby hats from Paul Smith, New Urban UK and even Accessorize. I even had (and still have) 3 wigs on the shelf that stare at me every morning when I wake up!!! Sorry ladies, I call them my ‘Hairy Hats‘ because everyone knew I was bald! Because my hair is growing in at a very fast pace, in a darker colour, a new texture, and featuring something I have never seen or had to deal with – curls – I have to come up with a styling regime as unique as the one I had when it was actually falling out the first time! Well, sadly, there’s no Style Guru to catch you on the back end of Chemotherapy, we all have to figure it out ourselves now, ladies and that is so unfair! I mean here you are, having gotten through the hardest part – diagnosis and then surviving treatment – and now you have to figure out what works best stylistically all over again – c’mon are you joking?! Spotting trends and finding new products in fashion was part of my former professional career/life in New York City. I thought I’d take a little crack at this since no one else really is, at least no one has surfaced yet for BC patients! I want to bring suggestions and solutions to chemotherapy and medical hairloss patients struggling with something so very very important during treatment which is Styling! I have already done some research on what will trend this Fall, and I am actually very excited about the patterns, styles, and colours, I almost wish I didn’t have my hair to contend with!!!! So here goes, my first report…. 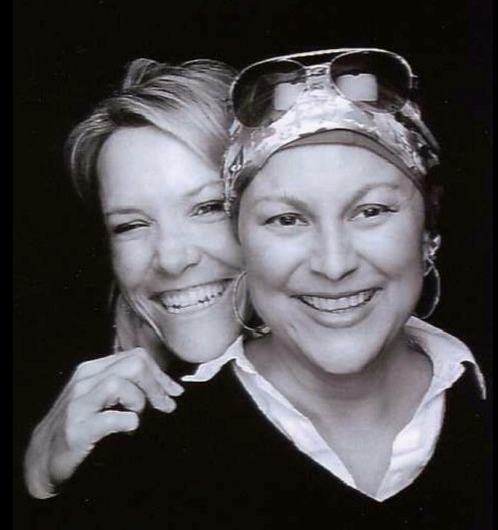 Me with my little sister Lulu - No Hair, No Lashes, No Brows - NO WAY! Reaching out for the Farmers Almanac (US) The Weather Outlook (UK), Net Weather TV (UK), or referring to Accuweather.com (US) is a waste of time for someone suffering from medical hairloss – face the facts ducks, you are going to be cold this winter whatever the weather is like. Bald is as bald does, it will always be shivering cold! So, it’s best to get your game face on and do what you can to stay warm! Layering is important to patients undergoing Chemotherapy for many reasons and in other capacities. The trick is always to stay warm but not so overdressed you can’t strip down in 5 seconds flat during a hot flash! Light, simple layers make for easy escape items. For the top, where heat escapes the most BTW, Beanies are the best layering tools. 100% cotton for washing and maintenance ease is always BEST. Synthetic materials act more as heat conductors, create more issues and against the skin then anyone wants to deal with in open social spaces – keep to what you know best – all natural! AND THE BONUS BITS: Not only does it provide for extra and secured warmth, but gives off the illusion of hair underneath a scarf or hat. A company that I would highly recommend is Bold Beanies (UK). The founder, Emmillienne Rebel, is a Breast Cancer survivor herself and designed and manufactured her Bold Beanies after suffering hair loss and the frustration searching for proper, easy and breathable headwear, that won’t slip or fall off your head whilst lunching with 200 of your closest friends! 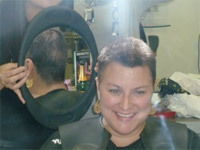 And just because you are losing or have lost your hair doesn’t mean you can’t look fabulous ladies! And monochromatic is not a colour you want to introduce to an already ashen gray face during treatment. They have fashion prints and colours too! Bold Beanies provide what’s necessary so you can get dressed and move on with your day! I wold definitely suggest buying at least 1 for each day and the reason is, some women suffer menopausal symptoms (like I did and still do!) whilst undergoing treatment and writing from experience you have to change and wash your Beanies quite a bit. These symptoms resemble hot flashes and they leave sweat marks in waves of dried salt, it’s gross and weird, but it’s true. So get some Bold Beanies, grab a scarf and a hat and you’re on your way! Next TRENDSPOTTING REPORT will cover hats + scarves in all price ranges from Gucci, Pucci, Ferragamo to LK Bennett, H&M and Accessorize – how the greats work best with the Highstreet fashions – everything and anything is possible! Bold Beanies are sold exclusively on-line at www.boldbeanies.co.uk. And remember, they sell them for children. When I purchased mine, Emillienne suggested I get one for each of my children so when I wore mine, they could wear theirs too! It’s a fun movie night suggestion! This entry was posted in ALL POSTS, Cancer, Chapters in Treatment, Fashion & Beauty, TRENDS FOR CANCER and tagged beanies for Breast cancer, Beanies for cancer patients, Cancer hats, fashion beanies. Bookmark the permalink. I love that day so much!! Fantastic blog post, We are checking back regularly to search for improvements.